Arnaldo Coro Antich, aka Arnie Coro, is a Cuban radio host, academic and popular amateur radio operator. He is a cofounder of Radio Havana. He hosts the English language Radio Habana show DXers Unlimited which broadcasts twice a week. He is also a professor of broadcasting at the University of Havana. His amateur radio call sign is CO2KK. 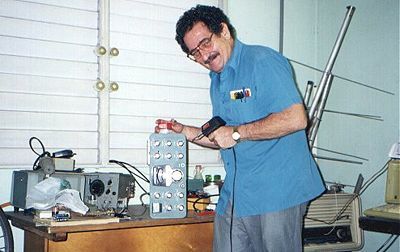 In Cuba, Coro is considered "the guru of ham radio operators" and is credited for increasing interest in Cuban amateur radio operation and has garnered many fans in the United States. Due to the difficulty in acquiring radio equipment, Coro has managed to assemble his radio equipment from pieces of old radios, Soviet-era television sets and fax machines. This page was last modified on 12 February 2019, at 01:24.